Offshore Ocean Observatories, are composed of suites of surface and subsea instruments and sensors with long-term power supplies and permanent communications links that can feed data to scientific laboratories in real-time. Motivated by advances in computing, telecom, marine architecture and subsea sensor technology, researchers observe the oceans in real-time, for long periods of time, and sky around all the way to deepwater, including imaging and continuous sensor observation along the whole water column to the sea floor. Ocean observatories are designed to answer questions about how the seas and oceans work, their dynamics and peculiarities. They use state-of-the-art technologies and techniques such as satellite communications, acoustic modems, and fiber-optic cables, suites of sonars, Hi-res video and photos along the surface, sky, seafloor and water column to answer questions that cannot be answered by short-term expeditions maritime. Researchers plan to maintain their observations over months and years to study how the Earth, Ocean, and Atmosphere evolve and interact. They want to answer questions that cross scientific boundaries, such as how ocean chemistry affects biology or how the geology on the seafloor affects the physics of flowing water. Modern Ocean Observatories will allow scientists to adjust their experiments, control suites of instruments and continuously receive data from hundreds of miles away in dedicated laboratories ashore and/or aboard research vessels. This capability will also allow researchers to share what they learn in real-time with scientific colleagues, policymakers, educators, students, and the public. A small platform with a radius of less than 10 meters can easily accommodate the launching of customized atmospheric balloons packed with a suite sensors, including micro sensors spaced along its cable, allowing it to harness data from different heights along the air column up to a specific height. The same platform can launch underwater sensors along a deepwater umbilical with another suite of sensors on a smaller seafloor platform. Combined with the stationary surface/subsea observatory, wave-gliders and AUVs can be used to collect data from outer rings around a specific location and also feed this data to the database grid in real-time. One research vessel with offshore support characteristics, such as a large deck space and powerful crane would be enough to control the whole operation and would not even need to constantly keep station allowing this one vessel to control an array of observatories and fleets of wave-gliders and AUVs, with compact work-class ROVs, HROVs and Divers aboard ready for any IMR needed. To power all these sensors and cameras on the platforms, large lithium-ion batteries, solar, wind power will be used. 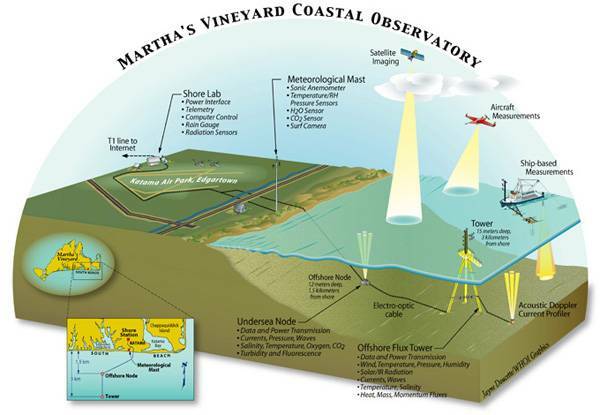 Today, the closer you can get to this level of ocean observation is through monitoring systems used on O&G deepwater subsea field development projects, or coastal projects such as tha Martha's Vineyard Coastal Observatory. However, it's easy money, that a systems such as aforementioned will soon be part of long-range research projects all over them worlds oceans. Such systems will not only offer a wealth of data on ocean and atmospheric dynamics but will at the same time act as guardians against oil spills, illegal fishing and other problems that affect the oceans and atmosphere.